NEW: Use JSGalBuilder for creating your own galleries! Why did I write JSGal? Because on my web site I used to have no PHP or any other server side scripting support, however I still wanted to have a gallery with the functions provided by server based gallery without the hassle of generating the gallery again everytime a image changes. Nowadays I my side does have scripting support, but the AJAX approach used in JSGal provides a far better user experience than any server side rendering based gallery - so I stick to it. What does JSGal look like? 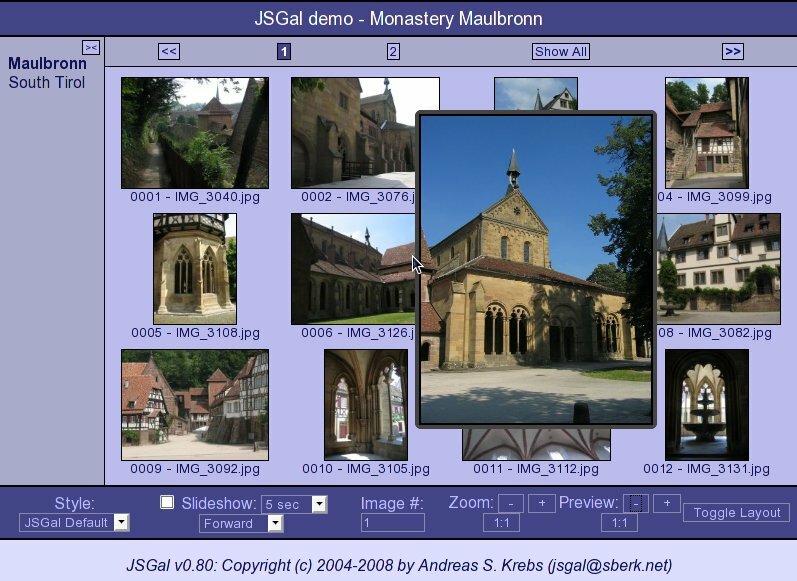 See screenshot above or for a live demo of JSGal look at the Demo Gallery (from a visit to the monastery of Maulbronn). What are the key features of JSGal? What browsers are supported by JSGal? Since I myself nowadays only use Firefox this is the browser which JSGal is developed and tested with. I more or less regularly test is with Opera and Konqueror, so they should also work. IE should work, however since I don't have any current windows version and rarely have to use windows nowadays :-), I don't test it regularly - so if it's broken please let me know. As for all other browsers: JSGal may work if they support DHTML and CSS - feel free to test them yourself. What web servers are supported by JSGal? Since no server side scripting is required, JSGal can be installed on any web server or it can be run from a local file system (e.g. a CDROM). Do you still want to know more about JSGal? Do you want to try JSGal yourself? Go ahead and download jsgal-0.83.zip or download JSGalBuilder a easy to use GUI application for creating JSGal galleries. The best of all it's distributed under the GNU General Public License (GPL) and is therefore absolutly free :-). For more details see the GNU General Public License. What versions of JSGal are available? Do you have any comments, styles sheets, scripts, extensions, ... you want to contribute to JSGal? Feel free to send them to jsgal@sberk.net.